The product weighs 100 lbs. and may require the use of a lift gate. If you do require a lift gate at your delivery, you'll have the option to add this FREE of charge when you checkout. The Peerless® Combi (PC) 160™ gas-fired boiler is a 91.1% efficient condensing boiler that uses premixed burner technology for optimal combustion. 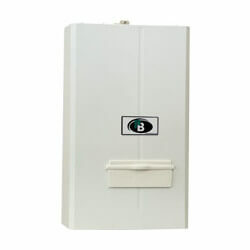 The boiler offers hydronic heat and domestic hot water in one complete unit by using an integrated coil-type hot water tank! Stainless steel tubes and an ASME rated heat exchanger are also features of the boiler. The patented premix air/gas modulation system, domestic hot water heat exchanger, and electronic controls make the PC160™ condensing boiler a top-notch choice for performance and dependability, safety, low emissions, and "green" operation.